The Ottawa Senators have signed goalie Mike Condon to a three-year contract extension worth $7.2 million. That’s an average annual value of $2.4 million. The netminder was slated for unrestricted free agency come July 1. 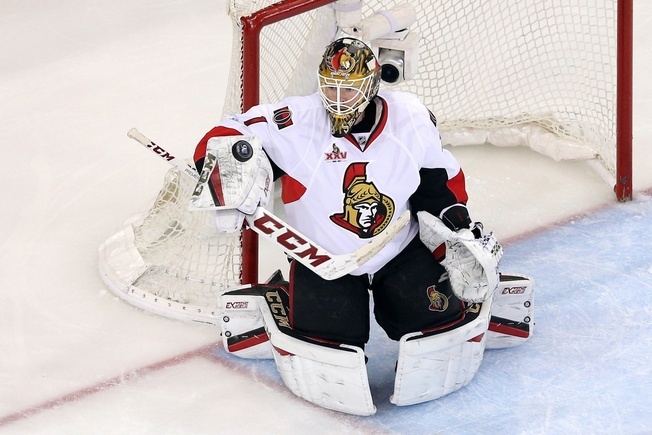 The Senators acquired Condon for a draft pick in November and used him in a relief role after starter Craig Anderson was at his wife’s side as she fought cancer. Subsequently, Condon posted a 19-14-6 record in 2016-2017 and played in a franchise-high 27 straight games from December 1 to February 4. He became the fastest goalie in franchise history to chart five shutouts, accomplishing the feat in his 32nd game with the Senators. And Condon and Anderson became the first goaltending tandem in Ottawa history to post at least five shutouts each in a single season, matching a franchise-best 10 shutouts. That record was initially set by the tandem of Patrick Lalime and Jani Hurme. Lalime had seven shutouts in 2001-2002, while Hurme had three. The extension is a nice reward for Condon, who patched things up and played well for the Senators while they dealt with adversity. Without his consistency in the face of sudden pressure, Ottawa may not have seen the post-season in 2016-2017. The 27-year-old goaltender went undrafted after spending his collegiate years with the NCAA Princeton Tigers. He subsequently signed an amateur tryout deal with the ECHL’s Ontario Reign for a brief stint before signing with the AHL’s Houston Aeros. By May of 2013, Condon signed a contract with the Montreal Canadiens and made his NHL debut in October of 2015. His first start (and his first win) was against the Senators and he went on to win accolades for his play in relief of an injured Carey Price. But by October of 2016, the Habs put him on waivers and he was claimed by the Pittsburgh Penguins. After a single period in Pittsburgh, he was traded to the Senators. And now, his future looks kind of bright all over again.